Superman and Lex take on Doomsday as the mysterious hooded man watches from his headquarters and Lois and Jonathan watch on television from their home. Lex tries to take down Doomsday solo but Superman flies the creature into the sky to get him away from the civilians. Doomsday recovers and knocks Superman through a helicopter and down to the ground. 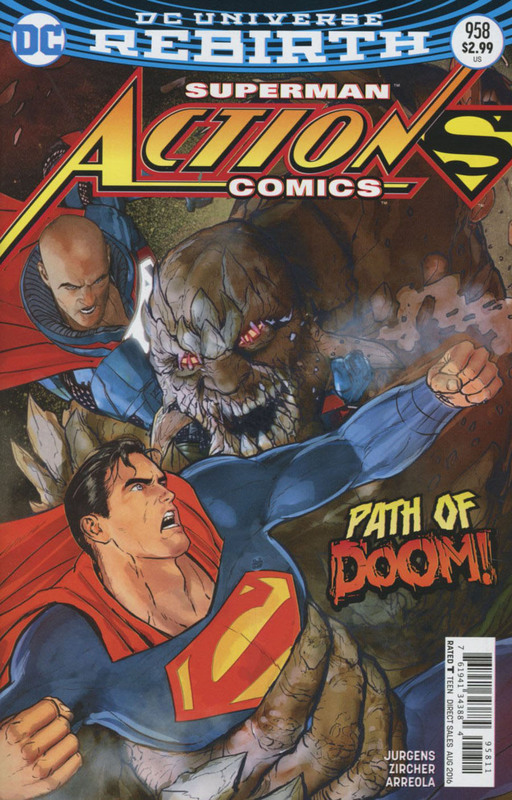 An elevated train gets in Doomsday's way and Lex launches into action to stop the creature as Superman takes care of the train. Lex finds out exactly how powerful Doomsday is as the creature tears into his armor and grabs him by the head. The mysterious hooded man watches all of this and tells the image of Superman that he has to think about what he will do next for only then can the man make his move. Story - 5: One of the things I like about Dan Jurgens as a creator is that he puts a lot of thought into the situations he puts his characters in. It would be really easy to just throw Doomsday and Superman at each other but we got more than that. We see Lex trying to step up and play the hero and getting smacked down for his efforts. We see Superman using his head against Doomsday and putting his past experiences to good use. A good friend of mine constantly jokes that Superman should solve all of his problems by throwing whatever that problem is into the sun so I have to admit to chuckling when Superman thinks of doing exactly that with Doomsday. I don't know if Superman flying Doomsday into space in this book was inspired by a similar scene in BATMAN V SUPERMAN but I liked it just the same. While the fight was amazing and I liked seeing Superman deal with having to face off against the creature that killed him it was the scenes with Lois that got to me the most. To Lois is just as important to the Superman mythos as Superman himself. This Lois in particular is my favorite incarnation of the character. Lois is tough and resourceful and will always fight for what she believes in. She's also human and I like that Jurgens explores how she would feel having to watch her husband fight the creature that killed him again. Then, on top of that she has to explain to her son that this is different than from other times that his father has gone into battle. "Well, son, normally I don't worry too much but this Doomsday creature killed your Dad once and I'm kind of worried he'll do it again and I know you have super powers but you can't go help him." Lois was absolutely right about that. While Jonathan is starting to display powers similar to Superman's he would be a distraction on the battlefield. The moment that just gutted me was her turning off the television because she couldn't watch anymore. It was extremely powerful and made me feel for her and Jonathan. The other mysteries are chugging along nicely. 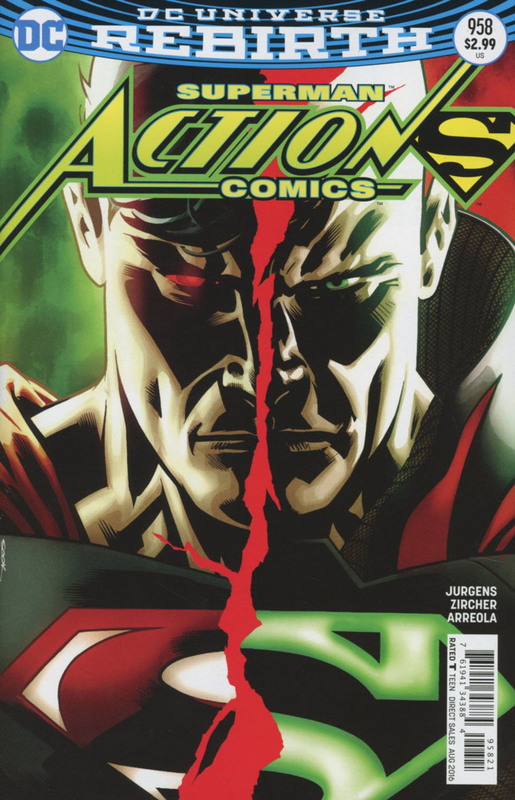 Jurgens has a lot of plates spinning at the moment between dealing with Superman returning to the role and Lex Luthor vying to be the next Superman for his own purposes and this new Clark Kent showing up and confusing the issue further to Mr. Oz acting all dark and mysterious to the truth behind this new/old Doomsday. A lot is happening but I never feel lost or confused. I'm just enjoying the ride and patiently waiting to see where all of this goes. Something is up and for the first time in years I am fully invested in seeing how events play out. All I can say is thank goodness this is a bi-weekly book because that part about me being patient? Yeah, I may have stretched the truth on that one. I'm not patient and I'm glad I don't have to wait a whole month between issues. Art - 5: The artwork on ACTION COMICS continues to be top notch. While the action was amazing I was more impressed with the quieter scenes, like Lois and Jonathan watching the fight on television. I am a bit embarrassed to admit that I did not notice all of the fantastic homages to the original fight with Doomsday. I consider myself something of an expert on that story so missing it makes me feel like I need to do some more course work to make up for that slip. To be fair I was really engrossed in the story so homages weren't on my mind but that's really no excuse. My only complaint with the art has nothing to do with Patrick Zircher. I don't like the blue boots. It might seem petty but I like the red boots. I was willing to let the red trunks go because the costume design we got was pretty sharp and I had absolutely no choice in the matter. The boots just seem like an unnecessary change and in some shots he looks like he's wearing a onesie. Zircher is doing the best he can with the design but it just needs to be tweaked. Cover Art - 4: There is something off about this cover and I can't quite put my finger on what that something is. It's not bad but there's something about the composition that I don't care for. Still, I'll take an iconic looking Superman fighting Doomsday over most of the covers we had been getting over the past few years. Variant Cover Art - 5: I love this cover. It's the perfect variant because I wouldn't want it as the main cover but it is still a neat piece of art. The color scheme is so striking that I don't mind the Angry Red Eye of Anger thing that Superman has going on. I seriously want a T-shirt of this.